This morning NPR ran my piece on Jelly, a casual coworking group that started in New York. I first read about Jelly a few weeks ago when Silicon Alley Insider mentioned that the group would be meeting at an apartment in Brooklyn about a mile away from where I live. I love things I can walk to. Grocery stores, restaurants, or coworking spaces. At first I figured I’d get out of the house and do some blogging. And then I remembered I was a reporter and pitched a story to NPR, which became part of their regular series on the workplace. The idea behind coworking is that you can kind of recreate the traditional office work environment even if you work independently. Self-employed, contract, and telecommuting workers pitch in some money rent an office space and avoid the distractions of the home office space that’s a bit too close to the TV/cat/video game console. You also get to bounce ideas off of other people in the office and have people to grab lunch with. Jelly is a bit more loose. The group doesn’t meet every day, just once every week or two. And you don’t have to pay a cent to join. You just sign up at a Wiki and show up. Many of the people at events know each other, but pretty much each time you’re at a Jelly you’ll be introduced to someone you’ve never met before. Almost everyone works on something technology related. There are a lot of web developers. But even the folks who are working on something else, say industrial design or crafting electronic musical instruments, have web sites and work that you can be done on the go with a laptop. 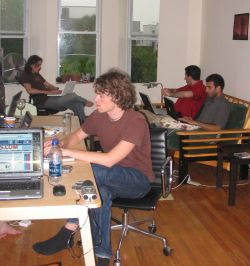 Amit Gupta and his roommate Luke Crawford founded Jelly in Manhattan, and for the first year and a half, events were held at their apartment. But Gupta is moving to San Francisco soon, and that’s launched Jelly into an exciting new period that I didn’t have time to touch on in my piece. There’s now a rotating list of Jelly regulars who are opening their homes to strangers. Not only do you get to meet new people, discuss interesting ideas, and take a break from the regular grind of home office work, you can see different parts of Manhattan and Brooklyn (so far). Related groups have also begun popping up in Philadelphia, Washington D.C., and people have expressed interest in setting up Jelly events around the world. Telecommuting is a privilage not a right! As a CIO, I love telecommuting as it saves gas and increases moral and suppose to increase productivity. When people start to abuse and play around we terminate them via email as they are stealing company time and money. It is not about being a cool boss, I just hate being taken advantage off. I always give my employees the benefit of the doubt but when they break that trust, they are out.